Registration for the second edition of the “Chemists for our future” awards is open! Mestrelab and AMSlab continue to support the enormous talent among students in the Department of Chemistry at the University of Santiago de Compostela (USC). Mestrelab and ASMLab aim to promote excellence in research as well as scientific and technological development among students. 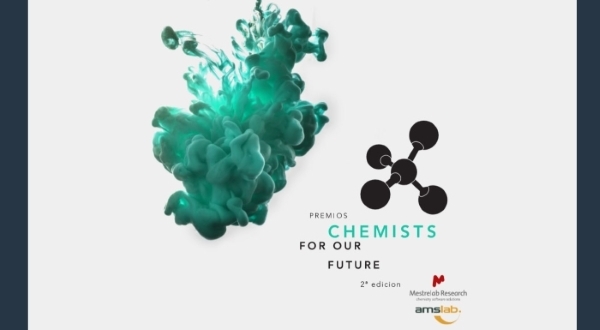 After a successful first edition recognizing the talent in the Faculty of Chemistry, we are pleased to announce registration for the second edition of the “Chemists for our Future” awards is now open. Students from the USC’s Chemistry Department can submit their applications to the University until December 3, 2018. Students who start, or end their degree in chemistry at the USC and are among the 3 best academic records in the June 2018 call will be eligible for the prize. In addition, the student who is awarded the first prize for finalization of Degree in Chemistry will be offered an internship at Mestrelab and AMSlab. The jury, consisting of the founders of the companies and the Dean of the Faculty, will assess curricular aspects related to the performance of the best students. The award ceremony will take place on December 14, 2018 at the Aula Magna of the Faculty of Chemistry of the USC. This initiative is supported by the Galician companies Mestrelab and AMSlab (co-sponsors of the event in collaboration with the USC), whose founders, Carlos Cobas and Manuel Lolo, founders of Mestrelab and AMSlab respectively, also studied in the Department and have now chosen to support young students co-sponsoring these awards in collaboration with their former alma mater, the USC. With these awards, they aim to motivate young students and promote the promising future of the world of chemistry and research, as well as complementing the student’s training by giving them the opportunity to experience working in an international environment.